The abundance of Western style shirts on the high street at the moment gives you the perfect opportunity to indulge your inner cowgirl! Shirts are the perfect transitional piece to take you from the chill of winter through into the fresh days of spring. For those chillier days, the detailed collars look great teamed with a simple knit worn over the top too. The first of my picks is a denim and lace shirt. It's not quite as fitted in real life as in the image above. I'd pick a size up to achieve a more relaxed look and pair it with skinny jeans and ankle boots. The next shirt is adorned with studs and collar tips. I think this would be perfect for a night out when paired with disco pants, heels and a messy bun. It's a great piece for a more androgynous look, but the silky material adds a bit of femininity. The last shirt is my favourite. I love the contrast of the denim collar and the checked material. I'd wear this one with a jersey skater skirt and Converse and pretend I was Jessie from Toy Story for the day! Which shirt is your favourite? How would you work the western trend? Loving all these shirts, right up my street! 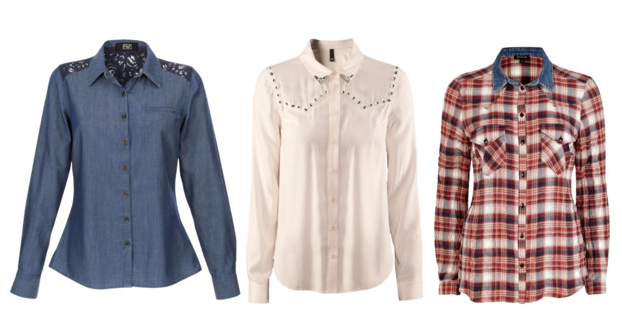 You seriously can't beat a western inspired shirt, the middle one is my favourite! Got the serious giggles at the Jessie from Toy Story comment - love it. Hannah www.cagneyandlace.com Check out my Neom candle giveaway!